First there were more top performing equity ETPs (12) than commodity ETPs (8). Of the 12 top performing equity ETFs, seven were ex US country specific ETFs and an additional four were dominated by US focused holdings. The final one focused on commodity related equity companies. Secondly, of the eight ETPs on the commodity side, five were ETNs, two were trusts and one was a fund. 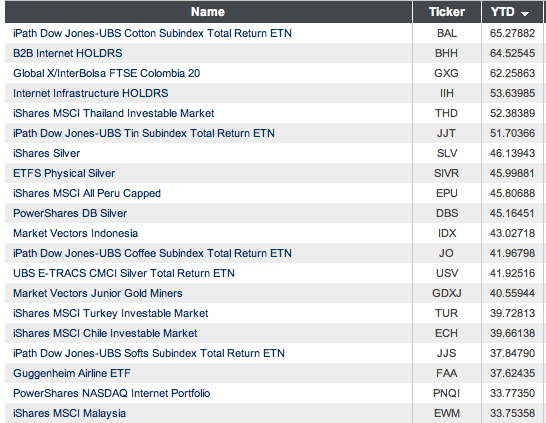 Half of the eight top performing commodity ETPs were related to silver. Of the other four commodity ETFs, three were soft commodities. None of the top performing commodity ETPs were related to Gold. Finally, from a sponsor perspective, iShares lead the pack with six of the Top 20 performing ETPs this year which seems consistent from a market share perspective. iShares was followed by perennial commodity leader iPath at four. The overachieving MarketVectors, Invesco and HOLDRS followed at two a piece. Global X, Guggenheim, UBS and ETF Securities rounded out the list at one a piece. What is surprising here is to see the lack of “leading ETF sponsor” (State Street and Vanguard for example) names showing up in the Top 20. This is especially the case with more equity ETP’s leading the performance pack than commodities. In addition, this data showcases the deep access to markets around the world that iShares has created. Will window dressing and the associated melt up help the ETP’s listed above? We shall see, with about a month left in 2010.